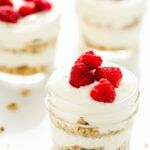 Vanilla Yogurt Parfait is easy and quick to make to your liking. Parfait is the French word for Perfect. Originally it was a layered ice cream dessert using fruit or syrup as the alternate layers. Jump ahead many years in time, and nowadays Parfait usually refers to a layered Yogurt dish, with granola, nuts, fruit, honey, and whatever else strikes your fancy. And it does look fancy! I used to be a savory breakfast kind of gal. Leading a very busy life doesn’t always allow for the time to cook up a batch of eggs & bacon. These days you can find me slurping my coffee while getting ready in the morning, and whipping up a quick Vanilla Yogurt Parfait to eat when I get to work (I can’t eat first thing in the morning. I get up way too early!). I have a go-to parfait method, and I’m sharing it with you today! It really is versatile, so this is more to give you inspiration. You can adjust any of the ingredients to what you like, or what you have on hand. 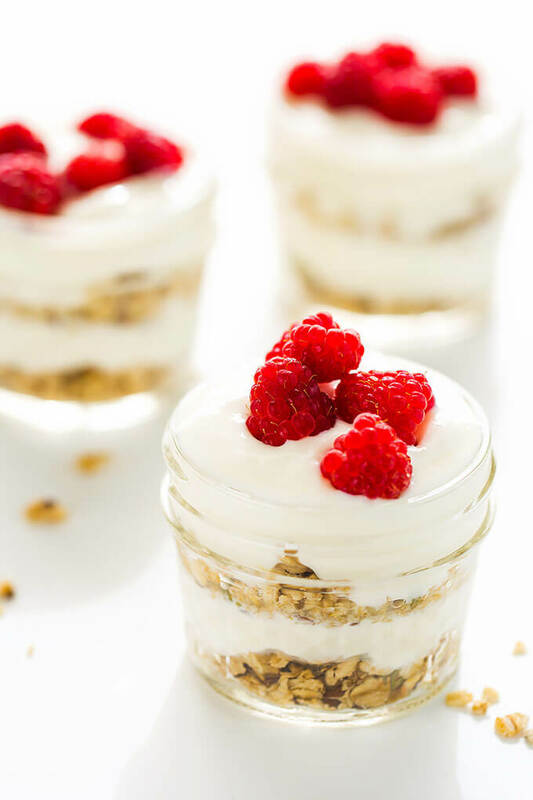 For instance, I don’t usually put raspberries in my parfait, but they are ripe on the bushes in our backyard right now, so they are the star of my morning vanilla yogurt parfait until raspberry season is over. Luckily for me, it’s also blueberry season, so they get an alternating turn in the parfait! Try my Blueberry Compote for a sweet alternative. Layers of delicious vanilla yogurt, fruit, and granola will make your mornings a little easier, and tastier! Quick and delicious as a snack or a dessert, too! 1/3 Cup Granola use your favorite. I like a mix with chia seeds and pepitas. Add honey and vanilla to yogurt. Mix well to combine. Layer in the dish: Granola, yogurt, fruit. Repeat. To make things even easier, you can just buy a vanilla flavored yogurt and omit the vanilla and honey. Since I like to make so many other things from my Greek yogurt, and I make my own, I like to use it. Plus I can control the sweetness!